Jumping games can be quite fun for playing and yet at the same time they will test your fast reactions and reflexes as you try to get as far in the game as possible. Because of the popularity of these games, finding the most relaxing, fun and addictive jump game for your smartphone is not easy to do. In order to make the search easier and help you, we searched and we discovered one incredibly entertaining jump arcade game that you will enjoy for sure. Let’s see what the game offers you. What is this arcade game about? This jump arcade game is developed on Android and iOS platforms as one easy to play and very entertaining arcade which will allow players to have fun jumping and climbing. 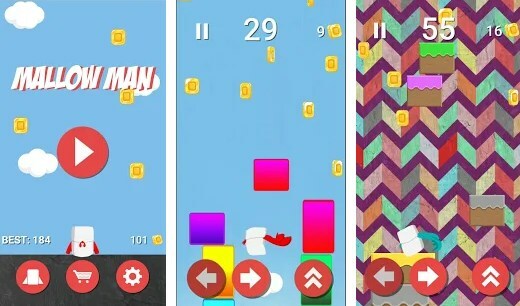 On the game, players will enjoy the cool sound effects and HD colorful graphics while they try to help the marshmallow Mallow Man to stay alive and avoid the hot chocolate that is rising by jumping of and climbing blocks. The marshmallow needs to escape the endless cup and the player needs to keep it alive. Why do we choose Mallow Man? Mallow Man with the features offered on it will get the players addicted to playing and jumping fast. On this game, the player needs to react fast, jumping and climbing but at the same time being careful not to hesitate for too long. Because the hot chocolate is rising constantly the Mallow Man can die if the chocolate reaches him so the player needs to jump off and climb the blocks avoiding being crushed by the falling blocks. In order to reach as far as possible on the game, the player needs to jump as far as he can, keeping the marshmallow alive and earning coins for his achievements. The coins earned by the player can be used for unlocking different styles of blocks and backgrounds, allowing the player to enjoy climbing with the marshmallow in different environments. Jumping and climbing will keep players entertained while they try to keep the Mallow Man alive and help him through the endless cup to escape from it. Download this game now for free to help the marshmallow escape the endless cup!